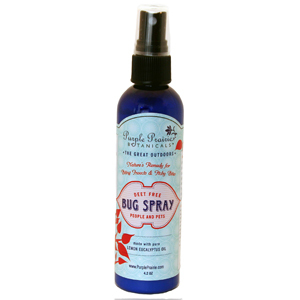 A natural, safe way to to keep gnats, biting flies and mosquitoes away. A special blend of essential oils and plant extracts in a clean witch hazel and water base. Deet free. Try it on itchy bites, poison ivy, chicken pox and other itchies too. Safe for all ages. 4.2 oz. bottle with spray top. "Not sure? Try a sample!" Frolicking outside will be fun again! Directions: Spray on exposed skin to keep away biting flies, gnats and mosquitoes. Repeat as necessary. Feel the relief. Avoid eyes. Store in a cool, dark place. 96% Natural Ingredients: aqua (water), hamamelis virginiana (witch hazel), polysorbate 20, eucalyptus citriadora (lemon eucalyptus) oil, azadirachta indica (neem) seed oil, cymbopogon schoenanthus (lemongrass) oil, eucalyptus globulus (eucalyptus) leaf oil, melaleuca alternifolia (tea tree) oil, lavandula angustifolia (lavender) oil, rosmarinus officinalis (rosemary) oil, mentha piperita (peppermint) oil. Traveling? Need a great gift? Just want to try it out? Sample Kit includes: 1- 1 oz. ..
A collection of 3 top sellers for the great outdoors. This kit brings comfort AND healthy skin. A..
1 oz. sample sizes are available for most of our products! These are perfect for sampling, travel..